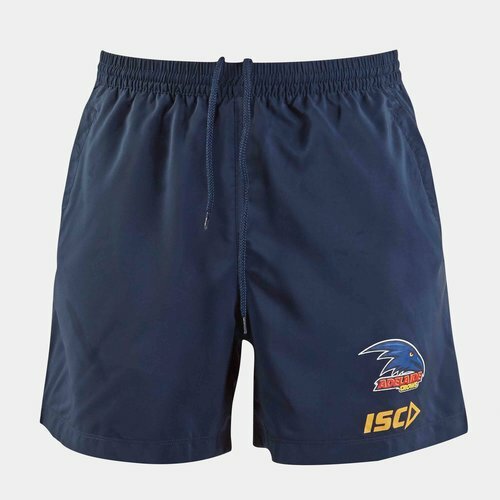 Be a Crow when you don this Adelaide Crows 2019 AFL Players Training Shorts from ISC. Adelaide Football Club is nicknamed the Crows and is a professional Australian rules football club that competes in the Australian Football League (AFL). They won both the 1997 and 1998 Grand Finals, and have appeared in 15 finals series in their 27-year history. These shorts are 100% polyester and come in navy with red and gold detailing just like the home guernsey and is traditional for the club. These team badge and ISC logo can be found on the bottom left leg.